This is an example of our custom chess. This time, we take 'Reality Kingdom' as the theme. Still using Teak wood material and carved by our expert craftsman, we designed a unique custom chess. This chess has carved in three dimensional shape and adopted realism style. The custom chess piece above is Knight piece in reality kingdom theme. Carved unique and beautiful in glossy black. 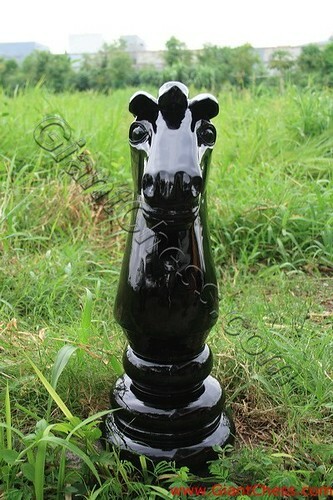 Not only for chess game, but this unique chess piece also perfect for house decoration. Reality kingdom chess is a best collection and decoration for your space. So that you can decorate your house and room with our unique product. Not only for indoor area, you can also use it for outdoor decoration. You can put it on your table in living room, library, office, or even at your patio and garden.